Great timing at the boot sale!! When something is 'out of fashion' or considered outdated because of newer technology, its a great idea to snap up such pieces. We drove past a boot sale on at Holloway, North London in February and despite it being freezing, I just had to have a wander around. I was especially pleased to spy this vintage watch by Timex, which must be from the 70s, judging by its design. I picked it up and decided to wind it up and to my surprise it started ticking!! I said to the lady that it worked and she said I could have it for £1!!! Well if I can pick up wind up watches for this cheap, then I'll certainly be collecting a few this summer at the boot sales. 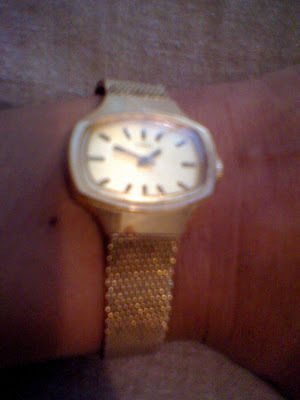 It fits the bill for my hankering of a vintage watch and to be honest, I've two battery operated watches in my jewellery box unworn as the batteries have run out and I had not been bothered to get new ones. As long as I keep this one wound up, it does the job for me!! It is superb! What a style setter you are. I really like the strap! It looks very chic! What a great find for a £1!! you can't get anything for a quid these days. Love the shape of the face. Wau, that is such a wonderful watch!!! If you ever consider selling it...because it´s outdated ect... ;-) ;-) ;-) Please contact me! Great find, I love the shape! `i love bootsales, i have not been to one in a while. It's so funny you posted this, because my watch just ran out of battery this morning! 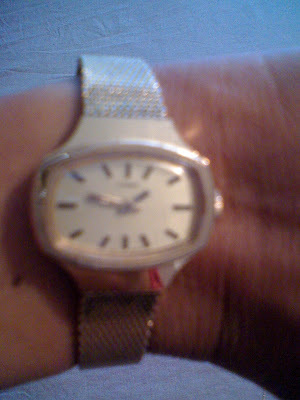 And I was annoyed, still wishing I knew where a vintage watch of mine was (which can just be wound up). oooh how gorgeous! i've been hunting for a good vintage watch - i want! Fantastic find. I love old watches. Hi everyone-thanks for all your lovely comments, as always, much appreciated!! That is just the coolest watch ever! I wish they still made styles like this. Great find! Really fantastic and for £1!!! I'm a sucker for watches, but my ever best deal was a new and authentic Chronotec bought on ebay for £10 + £4 postage! All the best. A.
Hi Sharon! Great find. How do you manage to find such fab stuff? When I go to flea markets, I love to sift through piles of vintage watches! Functional AND vintage! What a double delight. Have a great weekend. Hi ladies-thanks for stopping by with these lovely comments!! It's a great little watch and classic too! I love that it's self winding, what a lovely find. I used to have one just like this, wish I had kept it! Thrift Inspiration, Doing it Ralph Lauren Style!! Thrift Inspiration, Doing it Net-A-Porter Style! !